Michael McFadyen's Scuba Diving - Wedding Cake Island - SE One of Australia's greatest ever rock groups, Midnight Oil, had a hit song (albeit an instrumental one) about the bunch of rocks located off Coogee Beach, Wedding Cake Island. This haunting song is truely representative of the great dive sites located around the island. I first dived Wedding Cake in December 1990. 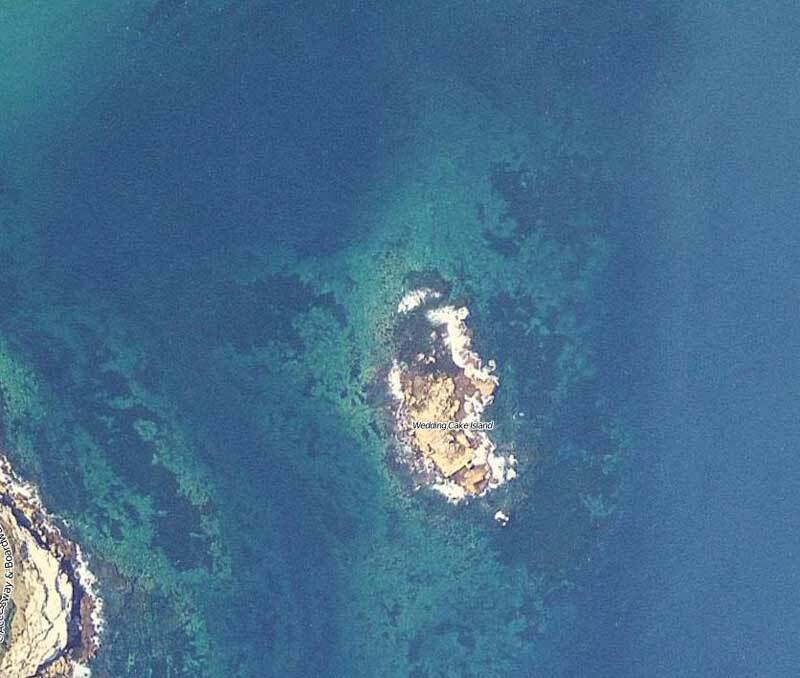 That dive was (I think) on the north-eastern corner of the island and was a pretty good dive from what I remember. I have also dived the north-western corner. 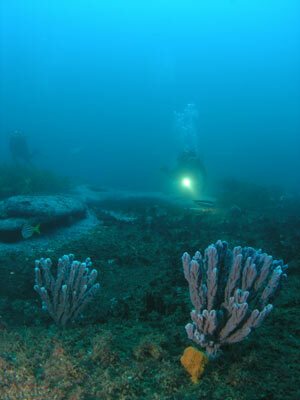 One of the problems with this dive site is that it is located quite a way from the closest boat ramp or wharf (it is 8.5 kilometres from the northern headland of Botany Bay and 10 kilometres from South Head in Sydney Harbour). It is a round trip of 41 kilometres from the Cooks River boat ramp at Kyeemagh in Botany Bay. Because of the distance, you need relatively calm seas to be able to get to the dive site. In late 2000 and early 2001, my dive club, St George Scuba Club had to cancel two outings to Wedding Cake due to rough seas. I am not aware of any dive shop that dives this site regularly but Pro Dive at Coogee and Sydney Dive Academy at Matraville may do it. 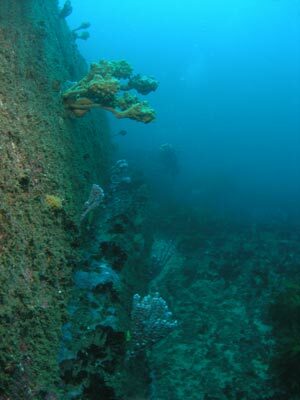 However, if you can find a dive boat that will take you there, you will find a relatively untouched dive location. Travel to 33° 55' 42"S 151° 16' 00"E and this will place you off the south-eastern corner of the island. Note that all the GPS Readings on my Web Site are taken using AUS66 as the map datum. If you use another datum you may be about 220 metres off the wreck. See my GPS Page for more details and how to convert readings. If you look to the west you will see a church spire. Line the right hand side of the spire up with the left side of the large toilet block down on the grassed area above the cliff face. Run in towards them and anchor in what ever depth you like (I suggest the 15 or 8 metre area). The main wall at Wedding Cake Island South East An old wife with the new wife, Kelly! In this section of the island, the reef starts at 5 metres near the rocks and drops to 8 metres, then 15 metres, then 18 metres and finally 22 metres on the sand. After descending, if there is no current, head east till you drop over the main wall to 15 metres (if you are not this deep already). Then follow the main wall to the north/north-east for about 100 metres. You will pass some small overhangs and caves. The wall has lots of sea squirts and some small gorgonias. Then head out deeper to the east. until you encounter the drop-off at 18 metres. The depth a short distance off here is about 22 metres and there is no real reason to go deeper as the most interesting things are to be found near the ledge. Turn to the south and follow the ledge for a while. There are also some enticing overhangs and small caves that are worth examining. After about 20 minutes, or when you have used half your air, you should go to the west back to the main wall. If you do not strike it after a few minutes, head to the north and you will meet it (the wall at 15 metres runs east-west a little to the south of the anchor site. If you have time, you can then go up over the main wall into shallower water towards the island. Return back to the boat. Fishlife can be profilic here and some of the fish that can be seen include wobbegong, yellow-banded seaperch, bream, snapper, old wife, luderick (huge numbers in shallows), blue groper, combfish, six-spined leatherjacket, black reef leatherjacket, rainbow runners, kingfish and cuttlefish as well as the breathtakingly beautiful eastern blue devil. 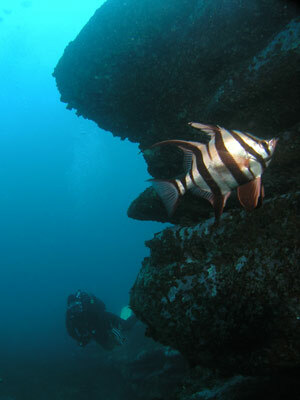 All the usual more common fish will also be seen, together with many species of nudibranch. 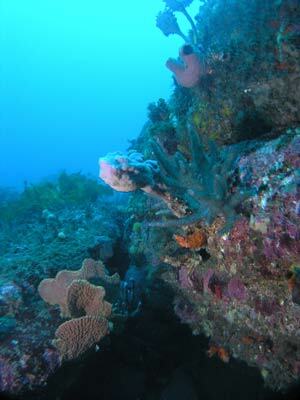 Sponges, ascidians and soft and hard corals also abound. In summary, an excellent dive site, worth many visits.